Hunter Renfroe (BT '11-'12) had an incredible week at the plate. Photo courtesy Mississippi State. For most college baseball teams across the country, this was the last week of the regular season. Some teams have already finished and a few others have some games this week. But this marked the end of some college careers (for those not lucky enough to go to their conference tournaments). The Big Train would like to wish the best of luck to all the former players who are moving on to the next stage of their careers and lives. 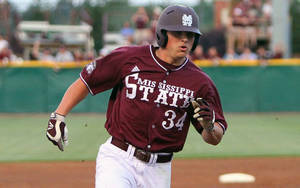 One player who still has some time in college is Mississippi State sophomore Hunter Renfroe (BT ’11-’12). Renfroe had an incredible all around week as he reached base 11 out of 18 times (two walks, hit by pitch) including a home run and two doubles, scored twice, drove in two runs, and stole a base. Renfroe helped the Bulldogs split the week including taking one of the three games against the #2 ranked Florida Gators. In the pitching department, St. Mary’s (CA) Martin Agosta (BT ’11) continued to roll along. Agosta, considered by many to be a late first-round pick in this year’s draft, got a win in eight innings of work while giving up only one earned run on seven hits and a walk while striking out twelve. Agosta is now 9-2 on the season. Other notable pitching performances: Ben Griset (BT ’12 / St. Mary’s (CA)) - 9IP, 2ER, 8H, 2BB, 12K… Kelly Secrest (BT’11-’12 / UNC-Wilmington) - 6IP, W, ER, 5H, 2BB, 3K… Robbie Kidd (BT ’12 / Tennessee) - 5.1IP, ER, 2H, 3BB, 4K… Ricky Holden (BT ’12 / UNC-Wilmington) - 4.2IP, SV, ER, 3H, 5K… Elliot Waterman (BT ’11 / San Francisco) - 5.2IP, W, 2ER, 4H, 2BB, 2K. Other notable hitting performances: Brennan Middleton (BT’11-’12 / UNC-Wilmington) - 7/18, 4R, 2RBI, 2B, 3B, 2SB… Tim Wise (BT ’11 / Cal Poly) - 3/11, 2BB, 3R, 2R, HR, 2 2B… Alex Hudak (BT ’11 / Florida Atlantic) - 6/14, 2R, RBI, 3 2B… Landon Appling (BT ’11 / Houston) - 6/13, BB, HBP, R, 2RBI, SB… Adam Barry (BT ’11 / Cal State Northridge) - 4/10, 2BB, R, SB.